Cigarette Tax to Fund Healthcare, Tobacco Use Prevention, Research, and Law Enforcement. In 2012, a state proposition to raise the California tobacco tax rate failed by one-half of 1 percent of the vote. Now, health advocates are trying again with Proposition 56. California has one of the lower tobacco tax rates in the country, and tobacco taxes haven't been raised since 1998. If Prop. 56 is approved, the state would have one of the highest, rising from 87 cents to $2.87 per pack of cigarettes. (New York is No. 1 at $4.35 per pack.) The tax would also apply to other tobacco products, such as cigars. This time around, e-cigarettes are included. Research shows that raising the price of cigarettes helps prevent teens and young adults from taking up the habit. The higher price can also help motivate current smokers to quit. Backers of the measure say that helping people quit or never start smoking at all will save lives. In addition, the tax would raise a lot of money. According to the state’s Legislative Analyst's Office, the tax is expected to generate $1.2 billion to $1.6 billion in its first year. Some of the money is earmarked for programs to help people quit or never start smoking or to train primary care doctors. But most of the money will go to Medi-Cal, the state's health insurance program for people who have low incomes. One in three Californians is covered by Medi-Cal. The proposition puts most of the tax revenue in a new special fund to be used by the state agency overseeing Medi-Cal. The agency can't use this tax revenue to replace other dollars. The tobacco industry opposes the tax and is the major funder of the "No" campaign. It cites a list of shortcomings in the measure. Opponents call the proposition a tax hike grab by insurance companies. This may be because most of the 13 million people covered by Medi-Cal are enrolled in managed care plans run by insurance companies and paid for by the state. They say the measure doesn’t require any additional people to be covered. Since the Affordable Care Act took effect in 2014, Medi-Cal has added 4.5 million more people. Most analysts believe there are few eligible people left who aren’t covered. And they say that no tobacco tax revenue will go toward schools. This may be a reference to a funding formula approved by voters in the 1980s, requiring that a percentage of general fund revenue go toward education. Prop. 56 revenue would skirt that formula. If passed, this tax would take effect April 1, 2017. Special taxes, called excise taxes, are collected on cigarettes and some other tobacco products. The state does not currently charge a special “excise tax” for electronic cigarettes. Currently, the tax on cigarettes is 87 cents per pack, with slightly higher taxes on other tobacco products. Money from these special taxes is spent on a range of programs, including tobacco education and services for young children. The excise tax on tobacco products would go up by $2 per pack of cigarettes. The tax would apply to cigarettes, cigars, chewing tobacco, and electronic cigarettes containing nicotine liquid, or “e-juice.” Money from the tax would help pay for several healthcare and education programs. The state would collect between $1.3 and $1.6 billion in the first year of the tax. In future years, the money collected could be lower if people buy fewer tobacco products. Most of the money would be used to pay for tobacco education, extra training for doctors, and the state’s health care program for low-income Californians. Raising taxes on tobacco products will help prevent people from smoking. Prop 56 would provide millions of dollars for important healthcare programs. Prop 56 does not provide enough money to help people quit using tobacco. Prop 56 would spend too much money enforcing the tobacco tax. 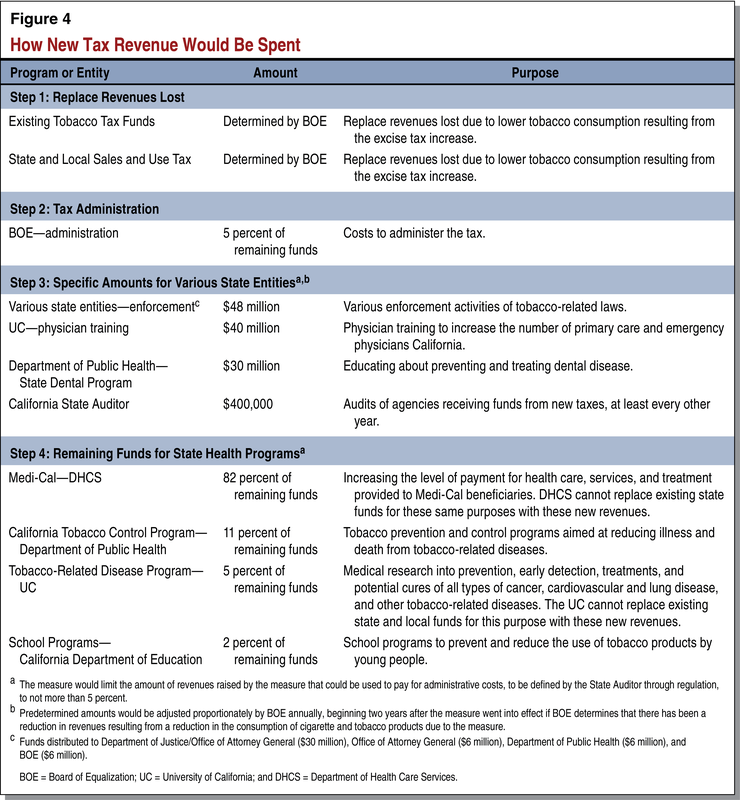 Should California increase taxes on tobacco and electronic cigarette products containing nicotine to fund healthcare and tobacco-control programs? Tobacco products are subject to state and federal excise taxes. California imposes excise taxes on distributors plus sales and local taxes paid by consumers on the final price at the time of purchase. California’s average retail price for a pack of cigarettes is about $6 which includes about $2.40 in taxes—87 cents state excise tax, $1.01 federal excise tax, and an average of 50-60 cents sales tax. California’s current excise tax on other tobacco products is equivalent to $1.37 per pack of cigarettes. Electronic cigarettes are not subject to state or federal excise taxes, but are subject to state and local sales and use taxes. Prop. 56 would increase the amount of state excise tax on cigarettes by $2 per pack, totaling $2.87, with a per-pack equivalent of $3.37 excise tax for other tobacco products, including electronic cigarettes. Revenue from the excise tax increase would go into a new fund to support existing tobacco-control and healthcare programs, with some monies going to enforcement of tobacco-related laws. Prop. 56 would amend the California Constitution to exempt the measure’s spending from the state’s spending limit, and exempt revenues from minimum funding requirements for education, similar to earlier voter-approved tobacco taxes. The Legislative Analyst’s Office estimates that, as a result of Prop. 56, consumers may reduce their purchases of tobacco products and change how they buy those products, such as through Internet purchases. If people do consume fewer cigarettes and other tobacco products because of Prop. 56, the current health and wellness programs paid for by existing taxes may receive less funding. Money from Prop. 56 would be required to backfill those losses, in an estimated amount of $200 million to $230 million. Nevertheless, Prop. 56 is estimated to generate $1.3 billion to $1.6 billion in new excise-tax annual revenue on cigarettes and other tobacco products (including e-cigarettes). Cigarette smoking kills more than 40,000 Californians annually. Tobacco tax increases are one of the most effective ways to reduce smoking and other tobacco use. Taxpayers pay $3.58 billion every year for tobacco-related healthcare costs. Under Prop. 56, tobacco users will help to offset this cost. Prop. 56 doesn’t take a dime from schools; it protects school funding while helping to keep our kids from getting hooked on deadly, addictive tobacco. Prop. 56 is not what it appears to be. Insurance companies will be paid $1 billion more for treating the same Medi-Cal patients they treat today. Prop. 56 allocates just 13% of new tobacco tax money will be allocated to treat smokers or stop kids from starting. Prop. 56 will undermine our Constitution’s school funding guarantee, diverting at least $600 million a year to health insurance companies and other wealthy special interests. Increases cigarette tax by $2.00/pack, with equivalent increase on other tobacco products and electronic cigarettes containing nicotine. Allocates revenues primarily to increase funding for existing healthcare programs; also for tobacco use prevention/control programs, tobacco-related disease research/law enforcement, University of California physician training, dental disease prevention programs, and administration. Excludes these revenues from Proposition 98 education funding calculation requirements. If tax causes decreased tobacco consumption, transfers tax revenues to offset decreases to existing tobacco-funded programs and sales tax revenues. Increased net state revenue of $1 billion to $1.4 billion in 2017–18, with potentially lower annual revenues over time. These funds would be allocated to a variety of specific purposes, with most of the monies used to augment spending on health care for low-income Californians. Cigarettes. Smoking cigarettes is the most common way to use tobacco. Other Tobacco Products. Other tobacco products can be consumed by smoking or other forms of ingestion. These include cigars, chewing tobacco, and other products made of or containing at least 50 percent tobacco. Electronic Cigarettes (E-Cigarettes). These are battery-operated devices that turn specially designed liquid, which can contain nicotine, into a vapor. The vapor is inhaled by the user. Some e-cigarettes are sold with the liquid, while others are sold separately from the liquid. These products are subject to excise taxes (which are levied on a particular product) and sales taxes (which are levied on a wide array of products). The excise tax is levied on distributors (such as wholesalers) while the sales tax is imposed at the time of purchase. 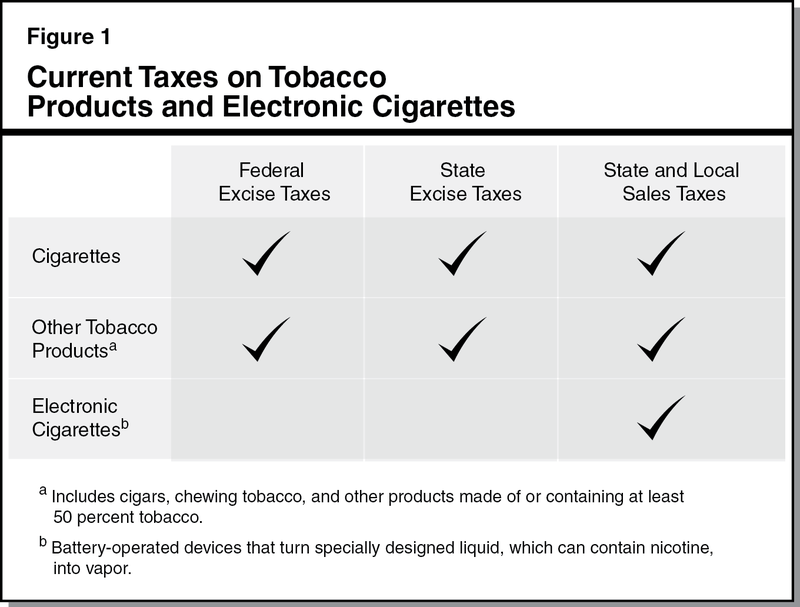 As shown in Figure 1, cigarettes and other tobacco products currently are subject to state and federal excise taxes as well as state and local sales and use taxes (sales taxes). E-cigarettes are only subject to sales taxes. Existing State Excise Taxes on Cigarettes. The current state excise tax is 87 cents for a pack of cigarettes. Figure 2 shows how the tax has increased over time and how these revenues are allocated for different purposes. Existing excise taxes are estimated to raise over $800 million in 2015-16. 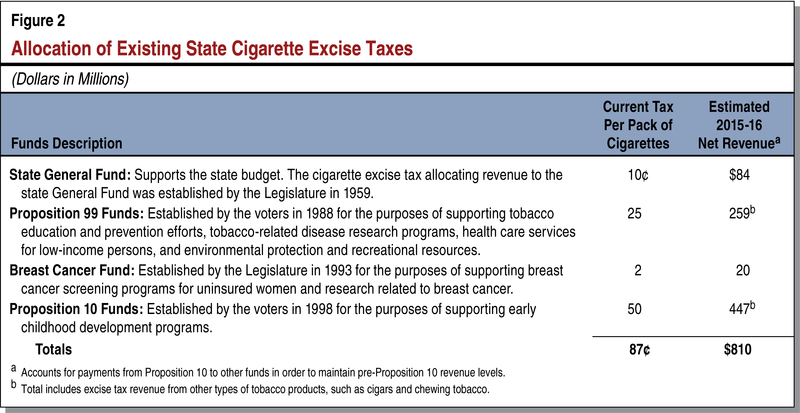 Existing State Excise Taxes on Other Tobacco Products. While excise taxes on other tobacco products are based on the excise tax on a pack of cigarettes, they are somewhat higher due to the provisions of Proposition 10. Currently, the excise taxes on other tobacco products are the equivalent of $1.37 per pack of cigarettes. Revenues from excise taxes on other tobacco products are allocated solely to Proposition 99 (1988) and Proposition 10 (1998) funds for various purposes, as described in Figure 2. Under current law, any increase in cigarette excise taxes automatically triggers an equivalent increase in excise taxes on other tobacco products. Existing Federal Excise Taxes on Tobacco Products. The federal government also levies excise taxes on cigarettes and other tobacco products. Currently, the federal excise tax is $1.01 per pack of cigarettes and varying amounts on other tobacco products. Existing Sales Taxes on Tobacco Products and E-Cigarettes. Sales taxes apply to the sale of cigarettes, other tobacco products, and e-cigarettes. Sales taxes are based on the retail price of goods, which includes the impact of excise taxes. The average retail price for a pack of cigarettes in California is close to $6. Currently, the sales tax ranges from 7.5 percent to 10 percent of the retail price (depending on the city or county), with a statewide average of around 8 percent. Thus, sales tax adds roughly 50 cents to 60 cents to the total cost for a pack of cigarettes. The sales taxes on cigarettes, other tobacco products, and e-cigarettes raises about $400 million annually, with the proceeds going both to the state and local governments. Most tobacco users in California smoke cigarettes. According to the California Department of Public Health (DPH), California has one of the lowest adult cigarette smoking rates in the country. The DPH reports that about 12 percent of adults smoked cigarettes in 2013, compared to about 24 percent of adults in 1988. While cigarette smoking rates in California have steadily declined over the past couple decades for a variety of reasons, this trend appears to have stalled in recent years according to DPH. As the number of individuals smoking cigarettes in California has decreased, so has the total amount of cigarette purchases by California consumers. As a result, revenues from taxes on these purchases also have declined. The DPH reports that e-cigarette use among California adults was about 4 percent in 2013, nearly doubling compared to the prior year. Because e-cigarettes are relatively new products, however, there is little information to determine longer-term use of e-cigarettes. Medi-Cal. The Department of Health Care Services administers California’s Medi-Cal program, which provides health care coverage to over 13 million low-income individuals, or nearly one-third of Californians. With a total estimated budget of nearly $95 billion (about $23 billion General Fund) for 2015-16, Medi-Cal pays for health care services such as hospital inpatient and outpatient care, skilled nursing care, prescription drugs, dental care, and doctor visits. Some of the services provided in the Medi-Cal program are for prevention and treatment of tobacco-related diseases. Public Health Programs. The DPH administers and oversees a wide variety of programs with the goal of optimizing the health and well-being of Californians. The department’s programs address a broad range of health issues, including tobacco-related diseases, maternal and child health, cancer and other chronic diseases, infectious disease control, and inspection of health facilities. Many public health programs and services are delivered at the local level, while the state provides funding, oversight, and overall strategic leadership for improving population health. For example, the DPH administers the California Tobacco Control Program—a Proposition 99 program—that funds activities to reduce illness and death from tobacco-related diseases with a budget of about $45 million in 2015-16. The Legislature recently passed, and the Governor signed in May 2016, new tobacco-related legislation that made significant changes to state law. Figure 3 describes these changes. Also in May 2016, the U.S. Food and Drug Administration (FDA) issued new rules that extend the FDA’s regulatory authority to include e-cigarettes, cigars, and other tobacco products. These recent changes do not directly affect the state taxes on these products or the programs that receive funding from these taxes. The State Constitution contains various rules affecting the state budget. Proposition 4, passed by voters in 1979, establishes a state spending limit. Proposition 98, passed in 1988, establishes a minimum level of annual funding for K-12 education and the California Community Colleges. This measure significantly increases the state’s excise tax on cigarettes and other tobacco products and applies this tax to e-cigarettes. The additional revenues would be used for various specified purposes. The major provisions of the measure are described below. Increases Cigarette Tax by $2 Per Pack. Effective April 1, 2017, the state excise tax on a pack of cigarettes would increase by $2—from 87 cents to $2.87. Raises Equivalent Tax on Other Tobacco Products. As described earlier, existing law requires taxes on other tobacco products to increase any time the tax on cigarettes goes up. Specifically, state law requires the increase in taxes on other tobacco products to be equivalent to the increase in taxes on cigarettes. Accordingly, the measure would raise the tax on other tobacco products also by $2—from $1.37 (the current level of tax on these products) to an equivalent tax of $3.37 per pack of cigarettes. Imposes New Taxes on E-Cigarettes. 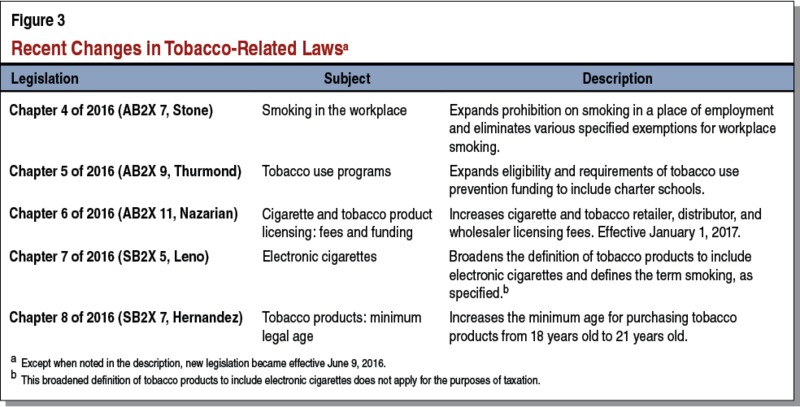 As noted above, the state does not currently include e-cigarettes in the definition of other tobacco products for purposes of taxation. The measure changes the definition of “other tobacco products” for purposes of taxation to include e-cigarettes that contain nicotine or liquid with nicotine (known as e-liquid). Changing the definition in this way causes the $3.37 equivalent tax to apply to these products as well. How Would Revenues From New Tobacco and E-Cigarette Taxes Be Spent? Step One. The measure requires that new revenues raised by the measure first be used to replace revenue losses to certain sources (existing state tobacco funds and sales taxes) that occur as a result of the measure. These revenue losses would occur due to lower consumption of tobacco products due to the higher excise taxes. Step Two. The state Board of Equalization would then receive up to 5 percent of the remaining funds to pay for administrative costs to implement the measure. Step Three. The measure provides specified state entities with fixed dollar amounts annually for specific purposes, as described in Figure 4. Step Four. The remaining funds would be allocated—using specific percentages—for various programs, primarily to augment spending on health care services for low-income individuals and families covered by the Medi-Cal program. Required Audits. The California State Auditor would conduct audits of agencies receiving funds from the new taxes at least every other year. The Auditor, who provides independent assessments of the California government’s financial and operational activities, would receive up to $400,000 annually to cover costs incurred from conducting these audits. Revenues Exempt From State Spending Limit and Minimum Education Funding Level. Proposition 56 amends the State Constitution to exempt the measure's revenues and spending from the state's constitutional spending limit. (This constitutional exemption is similar to ones already in place for prior, voter-approved increases in tobacco taxes.) This measure also exempts revenues from minimum funding requirements for education required under Proposition 98. This measure would have a number of fiscal effects on state and local governments. The major impacts of this measure are discussed below. New Excise Taxes Would Increase State Revenue by Over $1 Billion in 2017-18. This measure would raise between $1.3 billion and $1.6 billion in additional state revenue in 2017-18—the first full year of the measure’s implementation. The excise tax increase would result in higher prices for consumers. As a result, consumers would reduce their consumption of cigarettes and other tobacco products, including e-cigarettes. (Many consumers might also change the way they buy these products to avoid the tax.) The range in potential new revenue reflects uncertainty about how much consumers will reduce their purchases in response to higher prices. The low-range estimate ($1.3 billion) assumes consumers have a stronger response to the tax than under the high-range estimate ($1.6 billion). In future years, revenues may decline relative to 2017-18 due to changes in consumer choices. Applying Excise Taxes on E-Cigarettes Also Would Generate Additional Revenue for Existing Tobacco Funds. As noted earlier, the measure expands the definition of other tobacco products to include e-cigarettes. This change makes e-cigarettes subject to the taxes passed by voters in Proposition 99 and Proposition 10. As a result, the funds supported by those two propositions would receive additional revenue due to this measure. This additional revenue likely would be in the tens of millions of dollars annually. Over $1 Billion in Increased Funding in 2017-18, Mostly for State Health Programs. Figure 5 estimates the amount of funding each program and government agency would receive from the new tax revenues in 2017-18. After covering revenue losses resulting from the measure, the revenue available for specific activities funded by the measure—mostly health programs—would be between $1 billion and $1.4 billion. If cigarette use continues to decline, these amounts would be somewhat less in future years. In addition, much of the added spending on health programs would generate additional federal funding to the state. As a result, state and local governments would collect some additional general tax revenue. Potentially Little Effect on State and Local Sales Tax Revenue. Higher cigarette and other tobacco product prices would increase state and local sales tax revenue if consumers continued to buy similar amounts of these products. However, consumers would buy less of these products as prices increase due to the measure’s taxes. As a result, the effect of the measure on sales tax revenue could be positive, negative, or generally unchanged, depending on how consumers react. Under the measure, if the state or local governments received less sales tax revenue as a result of the measure’s taxes, those losses would be replaced by the revenue raised by the measure. Effects on Excise Tax Collection. As described in Figure 4, the measure would provide additional funding to various state agencies to support state law enforcement. These funds would be used to support increased enforcement efforts to reduce tax evasion, counterfeiting, smuggling, and the unlicensed sales of cigarettes and other tobacco products. Such enforcement efforts would increase the amount of tax revenue. The funds also would be used to support efforts to reduce sales of tobacco products to minors, which would reduce revenue collection. As a result, the net effect on excise tax revenue from these enforcement activities is unclear. In addition, while cigarettes and other tobacco products—as currently defined—are covered by federal laws to prevent tax evasion, e-cigarettes are not covered. As a result, enforcement of state excise taxes on e-cigarettes may be more challenging if consumers purchase more of these products online to avoid the new taxes. The state and local governments in California incur costs for providing (1) health care for low‐income and uninsured persons and (2) health insurance coverage for state and local government employees and retirees. Consequently, changes in state law such as those made by this measure that affect the health of the general population would also affect publicly funded health care costs. For example, as discussed above, this measure would result in a decrease in the consumption of tobacco products as a result of the price increase of tobacco products. Further, this measure provides funding for tobacco prevention and cessation programs, and to the extent these programs are effective, this would further decrease consumption of tobacco products. The use of tobacco products has been linked to various adverse health effects by the federal health authorities and numerous scientific studies. Thus, this measure would reduce state and local government health care spending on tobacco‐related diseases over the long term. This measure would have other fiscal effects that offset these cost savings. For example, state and local governments would experience future health care and social services costs that otherwise would not have occurred as a result of individuals who avoid tobacco‐related diseases living longer. Further, the impact of a tax on e‐cigarettes on health and the associated costs over the long term is unknown, because e‐cigarettes are relatively new devices and the health impacts of e‐cigarettes are still being studied. Thus, the net long‐term fiscal impact of this measure on state and local government costs is unknown. State excise tax on cigarettes would increase by $2 per pack—from 87 cents to $2.87. State excise tax on other tobacco products would increase by a similar amount. State excise tax also would be applied to electronic cigarettes. 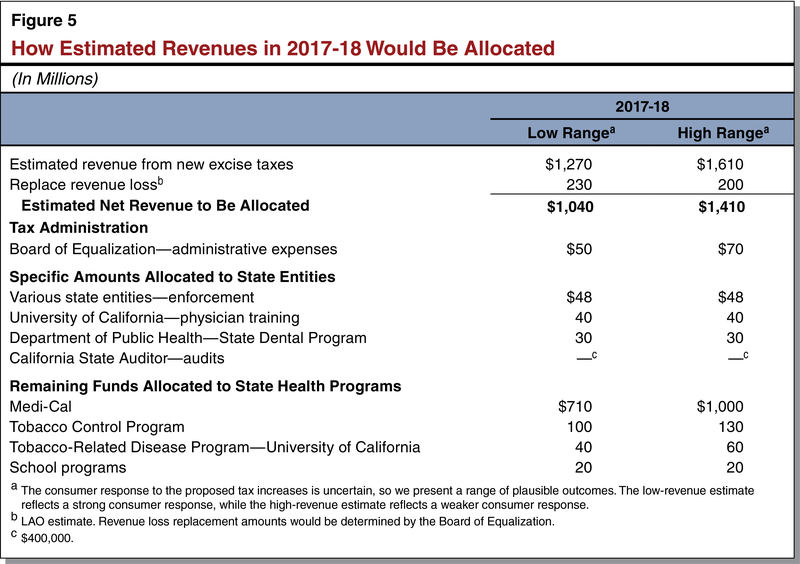 Revenue from these higher taxes would be used for many purposes, but primarily to augment spending on health care for low-income Californians. No changes would be made to existing state taxes on cigarettes, other tobacco products, and electronic cigarettes. The American Cancer Society Cancer Action Network, American Lung Association in California and American Heart Association are sponsoring Prop. 56 because taxing tobacco saves lives by getting people to quit or never start smoking. Get the facts at Yes0n56.org. Tobacco remains a DEADLY, COSTLY product that hurts all Californians—even those who don’t smoke. Each year, tobacco causes more deaths than guns, car accidents, HIV, alcohol, and illegal drugs combined. Tobacco is the #1 cause of preventable death—killing 40,000 Californians annually. Each year, tobacco-related healthcare costs Californian taxpayers $3.58 BILLION. At the same time, Big Tobacco has made billions in profits off California and is still trying to hook future generations into a lifetime of addiction. They know Prop. 56 will prevent youth smoking. That’s why they’ll spend millions of dollars to defeat Prop. 56: to protect their profits at our expense. Prop. 56 increases the tax on cigarettes and other tobacco products, including electronic cigarettes. The only people who will pay are those who use tobacco products, and that money will fund already existing programs to prevent smoking, improve healthcare and research cures for cancer and tobacco-related diseases. California taxpayers spend $3.58 BILLION every year— $413 per family whether they smoke or not—paying medical costs of smokers. Prop. 56 is a simple matter of fairness—it works like a user fee on tobacco products to reduce smoking and ensure smokers help pay for healthcare costs. Increasing tobacco taxes reduces youth smoking according to the US Surgeon General. Yet California has one of the lowest tobacco taxes nationwide. This year alone, an estimated 16,800 California youth will start smoking, one-third of whom will die from tobacco-related diseases. In every state that has significantly raised cigarette taxes smoking rates have gone down. Prop. 56 is so important because it helps prevent youth from becoming lifelong addicts and will save lives for future generations. Electronic cigarettes are Big Tobacco’s latest effort to get kids hooked on nicotine. They know that 90% of smokers start as teens. Teens that use e-cigarettes are twice as likely to start smoking traditional cigarettes. That’s why every major tobacco corporation now owns at least one e-cigarette brand. Some e-cigarettes even target children with predatory themes like Barbie, Minions and Tinker Bell, and flavors like cotton candy and bubble gum. Prop. 56 taxes e-cigarettes just like tobacco products, preventing our kids from getting hooked on this addictive, costly, deadly habit. Prop. 56 has built-in safeguards, including independent audits and strict caps on overhead spending and administrative costs. And Prop. 56 explicitly prohibits politicians from diverting funds for their own agendas. SAVE LIVES. VOTE YES ON 56. WE ALL WANT TO HELP THOSE WHO WANT TO STOP SMOKING, BUT PROP. 56 IS NOT WHAT IT APPEARS TO BE. Prop. 56 is a $1.4 billion “tax hike grab” by insurance companies and other wealthy special interests to dramatically increase their profits by shortchanging schools and ignoring other pressing problems. Prop. 56 allocates just 13% of new tobacco tax money to treat smokers or stop kids from starting. If we are going to tax smokers another $1.4 billion per year, more should be dedicated to treating them and keeping kids from starting. Instead, most of the $1.4 billion in new taxes goes to health insurance companies and other wealthy special interests, instead of where it is needed. PROP. 56 CHEATS SCHOOLS OUT OF AT LEAST $600 MILLION PER YEAR. California’s Constitution (through Proposition 98), requires that schools get at least 43% of any new tax increase. Prop. 56 was purposely written to undermine our Constitution’s minimum school funding guarantee, allowing special interests to deceptively divert at least $600 million a year from schools to health insurance companies and other wealthy special interests. Not one penny of the new tax money will go to improve our kids’ schools. PROP. 56 DOESN’T SOLVE PROBLEMS FACING CALIFORNIA FAMILIES. We have many pressing problems in California, like fully funding our schools, repairing roads, solving the drought and fighting violent crime. If we are going to raise taxes, we should be spending this new tax revenue on these problems. PROP. 56 FATTENS INSURANCE COMPANY PROFITS. In another deception, health insurance companies and wealthy special interests wrote Prop. 56 and are spending millions to pass it so that they can get paid as much as $1 billion more for treating the very same Medi-Cal patients they already treat today. They are not required to accept more Medi-Cal patients to get this money. Instead of treating more patients, insurance companies can increase their bottom line and more richly reward their CEOs and senior executives. In fact, the Prop. 56 spending formula gives insurance companies and other health care providers 82% of this new tax. PROP. 56 SPENDS OVER $147 MILLION PER YEAR ON OVERHEAD AND BUREAUCRACY. This $147 million can be spent each year with virtually no accountability to taxpayers. This could lead to massive waste, fraud, and abuse. In fact, Prop. 56 spends nearly as much money on administration and overhead as it does on tobacco prevention efforts! NO to wealthy special interests using our initiative process just to increase their profits. NO to cheating schools out of at least $600 million per year. NO to millions of new tax dollars going to overhead and administration with the potential for waste, fraud, and abuse. NO to rewarding health insurance companies and wealthy special interests with even bigger profits, instead of solving real problems like roads, violent crime and fully funding our schools. Please join us in voting ‘NO’ on Prop. 56. Prop. 56 was specifically written to financially benefit health insurance companies and other wealthy special interests. It’s just one more example of special interest ballot box budgeting. Over $16 million has already been contributed to pass it. Only 13% of this new tax money goes to treat smokers or stop kids from starting (Section 30130.55(b) of Prop. 56). 82% of this new tax money—$1 billion a year—goes to insurance companies and other wealthy special interests (Section 30130.55(a)) and they don’t have to treat one more patient to get the money. Nearly 10% can be spent on administration and overhead (Section 30130.57(a)&(f)). Prop. 56 has virtually no taxpayer accountability for how health insurance companies and other providers spend the money. CEOs and senior executives could reward themselves with higher pay and profits from our tax dollars. Prop. 56 deceptively cheats schools out of at least $600 million per year by amending the State Constitution to bypass California’s minimum school funding guarantee. In fact, cheating schools is the only reason Prop. 56 amends the Constitution. WEALTHY SPECIAL INTERESTS SHOULDN’T GET AWAY WITH USING PROP. 56 TO ENRICH THEMSELVES AT THE EXPENSE OF FUNDING SCHOOLS, FIXING ROADS AND FIGHTING VIOLENT CRIME. Follow the money for the truth at www.NoOnProposition56.com and then please join us in voting NO on Prop. 56. VOTE YES ON 56: SAVE LIVES. PROTECT KIDS. REDUCE THE HARMFUL COSTS OF TOBACCO. Tobacco is still a DEADLY and COSTLY problem. Every year, 40,000 Californians die from tobaccorelated diseases. This year alone, 16,800 California kids will start smoking. Each year, California taxpayers pay $3.58 Billion for tobacco-related healthcare costs. That’s $413 per family every year, whether you smoke or not. Under Prop. 56, tobacco users pay to help offset the $3.58 billion in tobacco-related healthcare costs taxpayers pay every year. Prop. 56 has strong accountability and transparency protections, including strict caps on overhead, ensuring politicians can’t divert money for their own personal agendas. Under Prop. 56, if you don’t use tobacco, you don’t pay. This is about FAIRNESS. It’s time for tobacco users to help pay for their healthcare costs instead of leaving it to taxpayers to foot the bill. Tobacco corporations have LIED for years about the dangers of tobacco. Now they are spending tens of millions lying so they can keep getting our children and grandchildren hooked—and protect their bottom line.